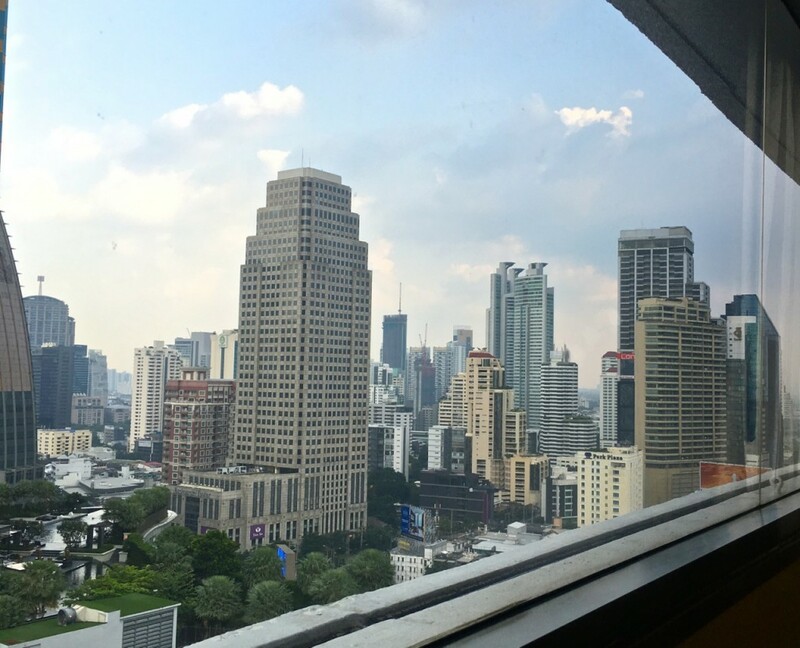 When choosing a hotel for a business or city trip to Bangkok, location is everything. 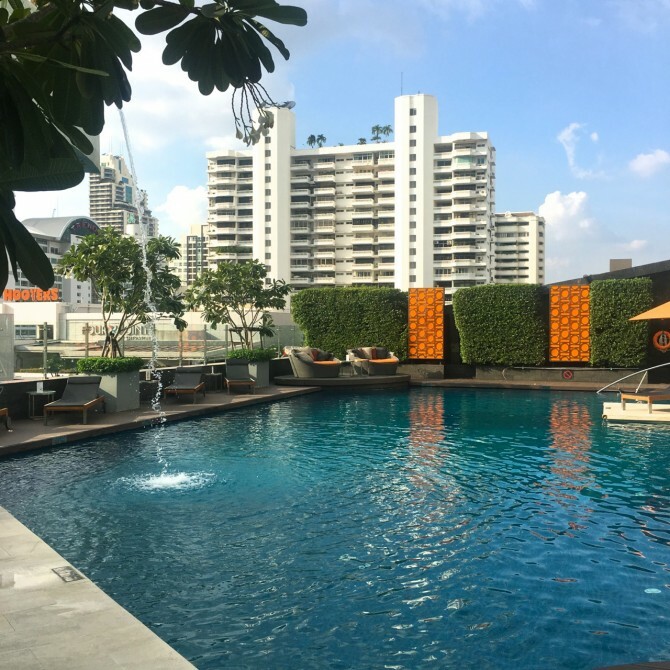 You want to be close to all the main attractions, spend as little time as possible in the famous Bangkok rush hour and having access to public transport is a big plus. Luckily there are hotels in Bangkok like the Westin Grande Sukhumvit, that offer exactly that and much more. I arrived in Bangkok after a 12 hour flight from Germany and was really looking forward to have a shower and a nap. As it was already late afternoon I wanted to avoid the rush hour and chose public transport over a taxi for the first time. I was surprised how easy it was to use and especially how fast it was. I just needed to change from the airport train into a BTS skytrain. The station “Asok” where I had to get out was just opposite the Westin Hotel. Just steps away is also the MRT underground station “Sukhumvit”. When entering the hotel someone immediately helped me with my luggage and showed me up to the lobby. As I was staying in one of the Westin Executive Club rooms the checkin took place in their Club Lounge on the 22nd floor. 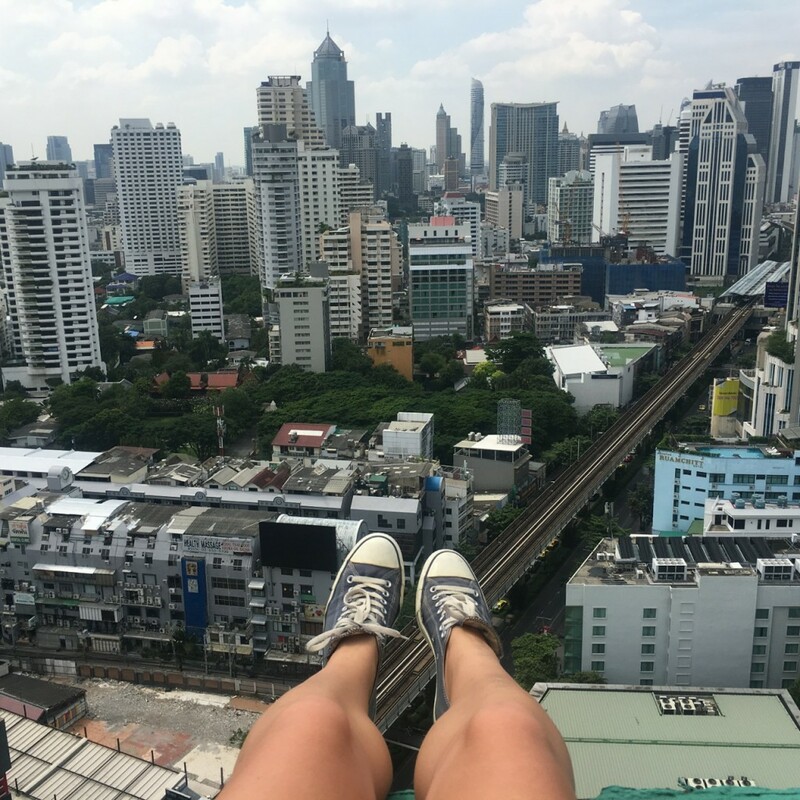 With a cold beverage I got to enjoy the view over Bangkok’s skyline while someone took care of the formalities for me. Breakfast in the Executive Lounge. Just one of the great benefits that come with booking one of their Executive Club Rooms. 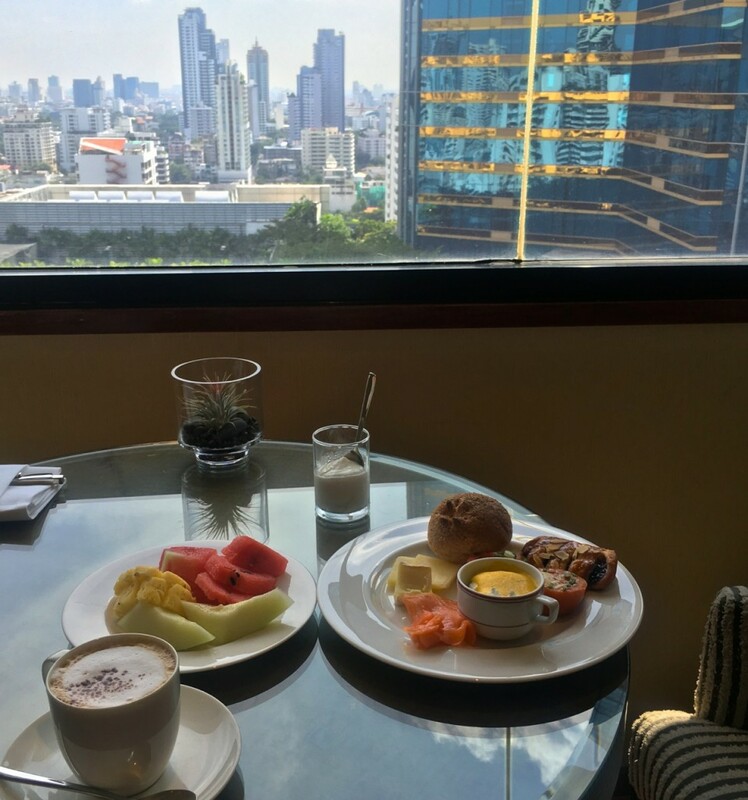 For my time in Bangkok I got to stay in one of their Westin Executive Club Rooms. The rooms are spacious with 42 square meters, offer a great view of the skyline and come with all the amenities you would expect from a 5 star hotel. As I have stayed with Westin a couple of times before, I was very much looking forward to their signature heavenly beds. 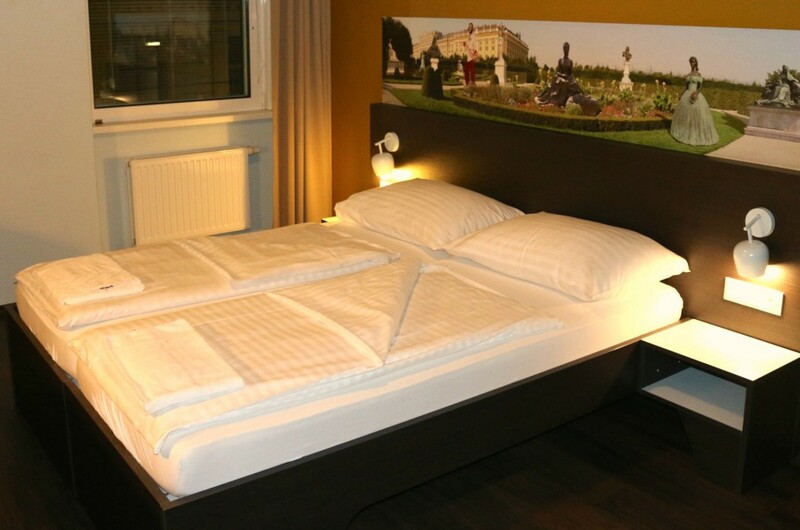 Somehow I always sleep incredibly well in those beds. When booking one of their Executive Club Rooms or Suites you will be granted some great benefits such as complimentary breakfast that can be taken in the Club Lounge if you are looking for a more private setting or in the main restaurant, access to the Club Lounge where complimentary drinks and snacks are served throughout the day, late check out and 2 hours use of the business meeting room just to name a few. 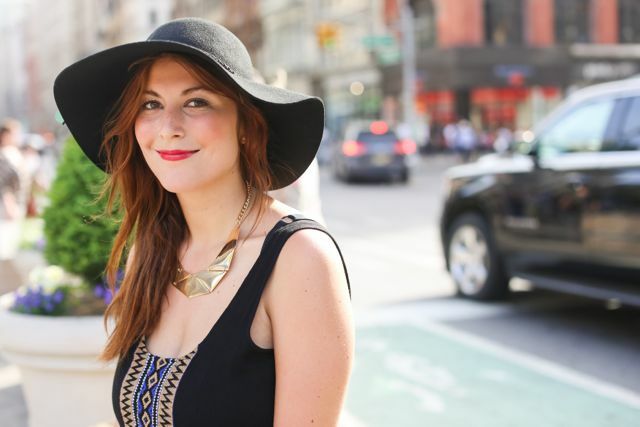 Read more about the benefits here. Especially when on a business trip those rooms are perfect. Did you know? 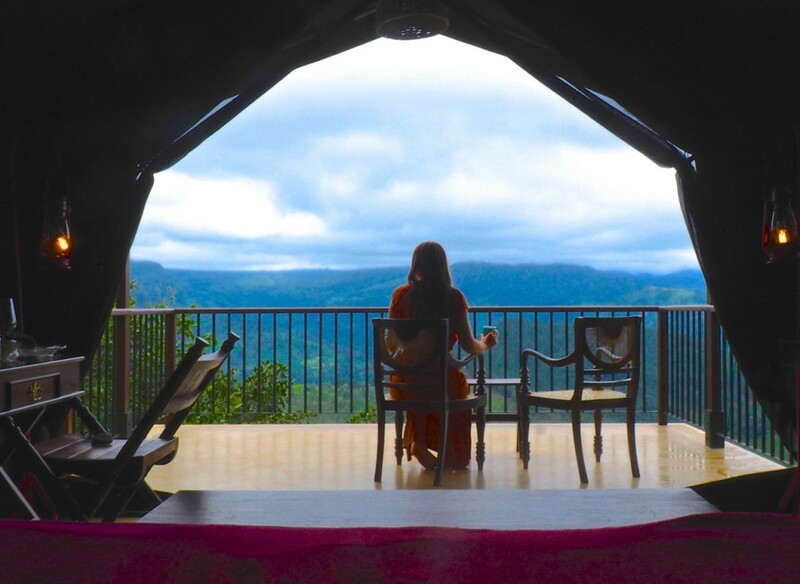 It is so worth to register to their SPG membership program because you can collect points when booking on the starwood website that can go towards a free stay, members enjoy exclusive discounts and receive other benefits such as complimentary wifi. Bangkok can be quite hectic and I really appreciated that the Westin was a place where I could come back to and recharge my batteries. Their 227 square-meter rooftop pool felt truly like an oasis in the city. It is big enough for a swim or a refreshing dip. The pool is surrounded by comfortable lounge chairs that are perfect too relax in or if you need to get some work done the wifi connection is really good throughout the entire hotel that you can even do it there if you wanted to. Adjacent to the pool and spa is the modern WestinWORKOUT Fitness studio that is open 24 hours and equipped with the newest cardio machines, strength machines and free weights. On top of that it is nice to know that all Westin hotels provide their guest with running maps, offer complimentary fitness classes and have New Balance workout gear for rent. At the Westin Grande Sukhumvit you can truly treat your taste buds. On top of 24 hour room service, guests have several great options to choose from. Seasonal Taste is their all-day dining venue where you can indulge in a gourmet hotel buffet or order from their menu. What stood out to me is that breakfast was served until 2 pm on weekends and the buffet offers a wide spread that there is something for everyone. If you have the time check out their Zest Bar&Terrace for a refreshing drink or cocktail or dine at their award-winning Kisso Japanese Restaurant. 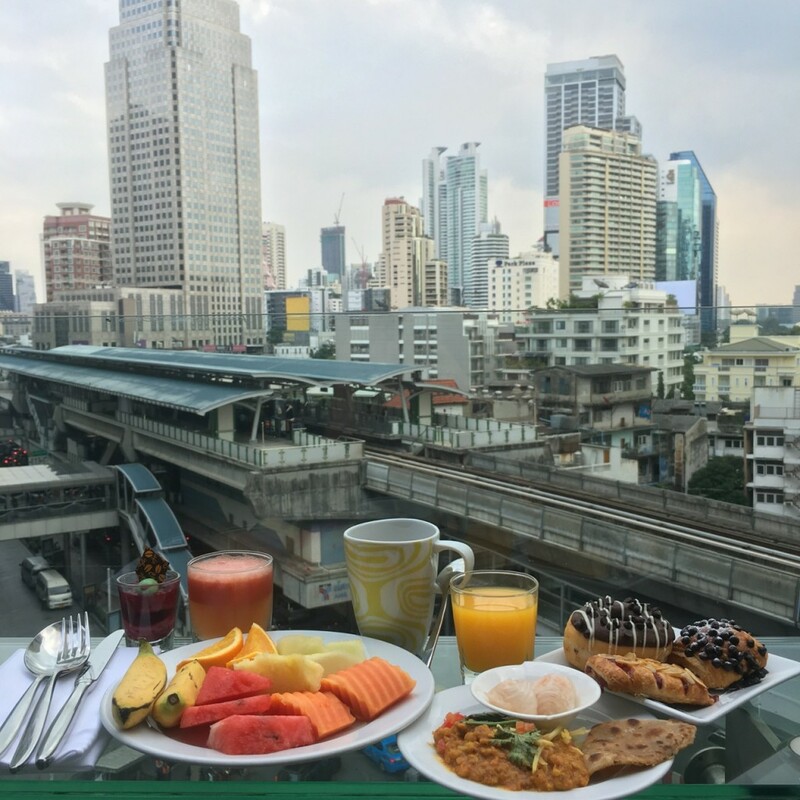 The view: The hotel offers amazing views of the Bangkok skyline. 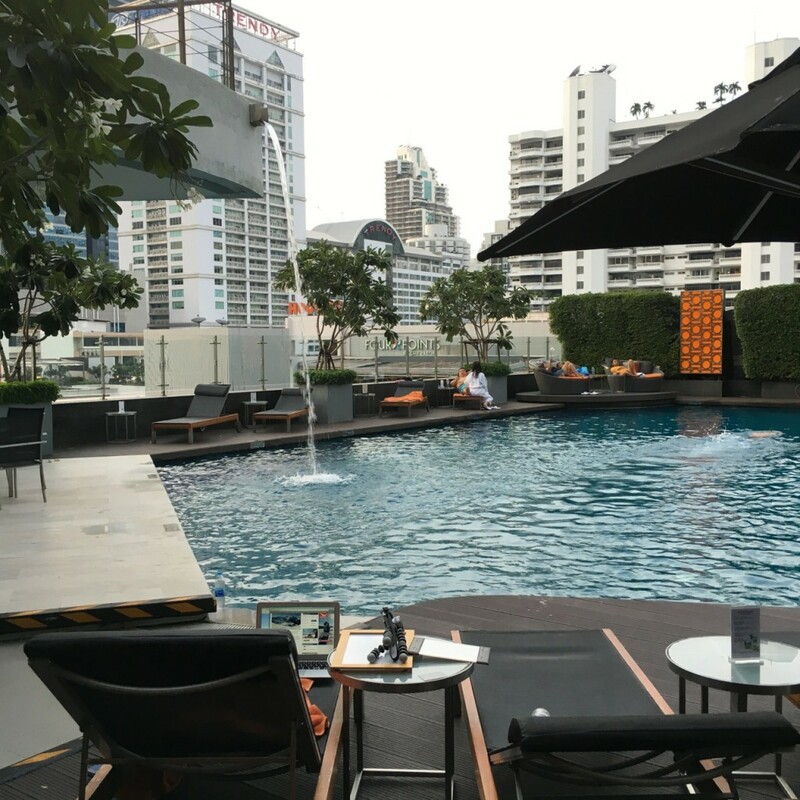 Westin Pool Party: Bangkok is legendary for its pool parties. Don’t miss out on the fun and check the dates for the great Westin Pool Party that they organize once a month. Along liquid refreshments and bites, there is also an awesome DJ line-up. 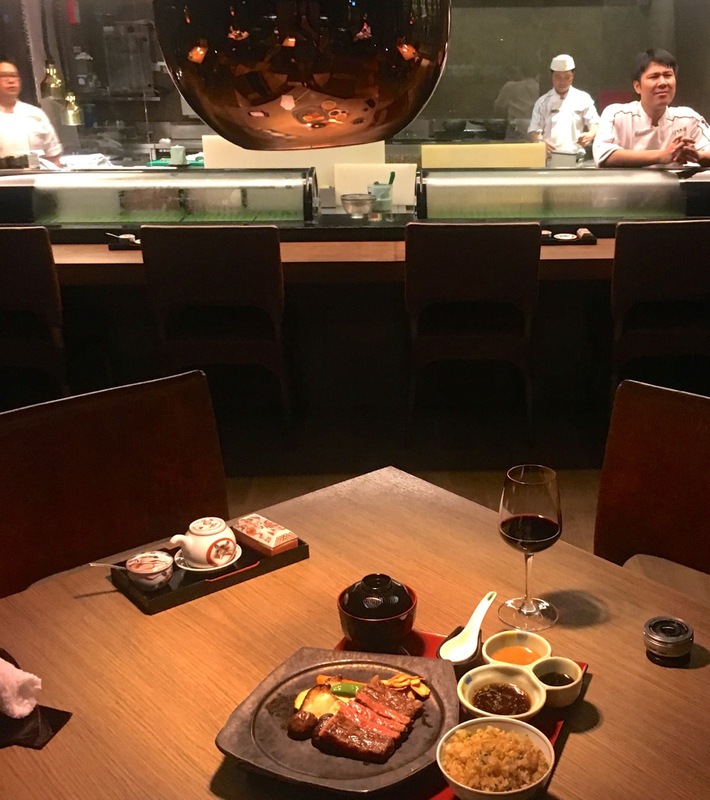 Dining at Kisso Japanese Restaurant: I got the chance to try their Japanese and really enjoyed the food and the ambiance. I chose the multiple course menu because it truly offered a bit of everything and the food was fresh and mouth-watering. The restaurant features an open kitchen, so you can watch the cooks preparing the dishes. Disclaimer: Traveler’s Little Treasures was a guest to the hotel, however my opinion is as always my own.